Osakans, (yup Lisa, that's the right word), love their food. And so do I! 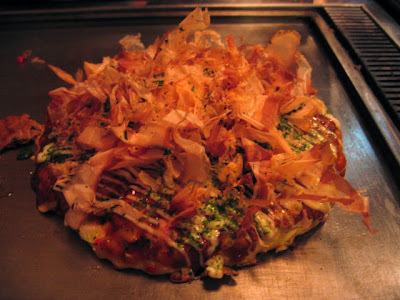 Here are a few photos and tidbits from Osaka that didn't fit into the other posts. Please to enjoy! Funky Osaka stall selling takoyaki in coke cups. 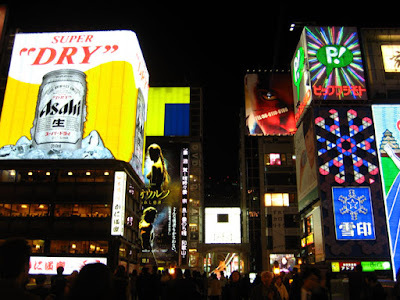 Travellers to Japan, prepare for the constant cries of 'Irasshaimase' (Welcome!) It never stops. Dessert at a little cafe near Ebisu bashi. 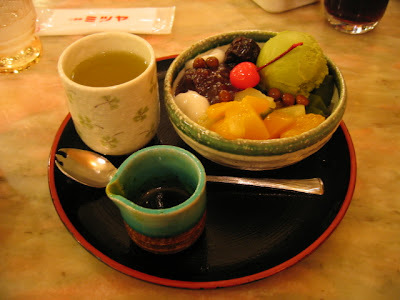 Fruit Anmitsu with red bean paste and green tea syrup. Yummmmy! Mmm... plastic food to whet the appetite. Next up, we have the Doguya-suji arcade. 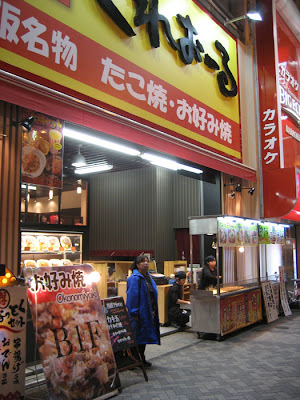 This place was, rather embarrassingly, the number one on my 'to-do' list in Osaka. 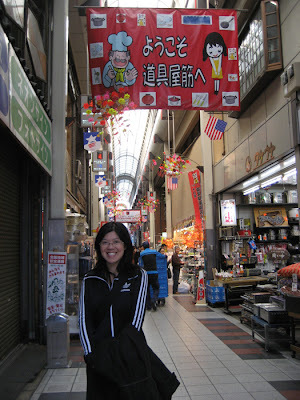 It is a massive arcade, FILLED with cookware stores. Oh! My! God! Think of the cookware section of a large Asian supermarket... times a thousand!!! 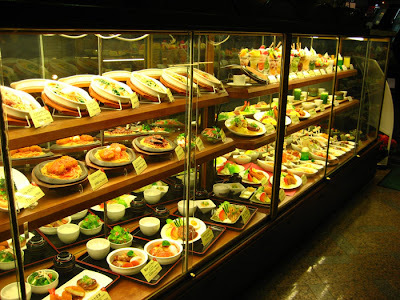 Those shops sold everything a Japanese restaurant owner could need or want, and more! 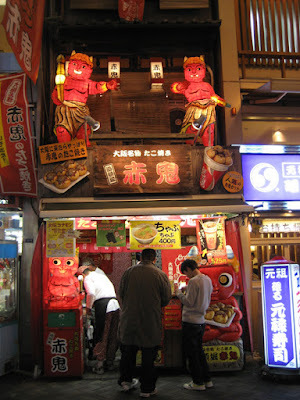 Takoyaki fryers, noren curtains for your door, red lanterns with 'fried noodles' printed on the side, knives, utensils, bowls and much, much more. Fantastic! However, I managed to limit myself to about ¥1,000, on a pretty little black jug with serving bowls. (Already shipped home. It will be a few months before they appear on this blog). A few weeks after this, I ended up spending quite a bit more at Kappabashi Kitchen Town in Tokyo, but that will have to wait for another post. And finally, a couple of photos of the lovely city itself. Famous view of Ebisubashi. 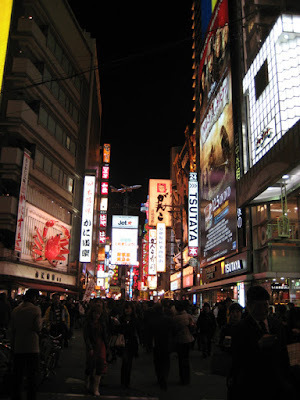 In and around Ebisubashi are some fantastic shopping arcades, chock-a-block full of fab shops. I found that browsing around the shops was a great way to work up an appetite between meals and snacks. 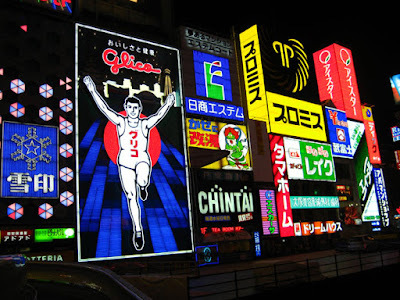 I love the Glico brand Running Victory Man! His motto is: 'Oishisa to kenkou!' Deliciousness and health! 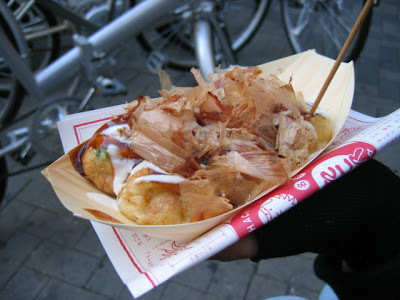 This makes me homesick for Japan so so bad.. I think Doguya-suji is my favourite place in all of Japan :) We always go to Kappabashi too but all that walking is so exhausting. lol. Just got back from Osaka yesterday. I agree. Doguya-suji is my favorite place too. Each day I spent a couple of hours going up and down this alley just to see if I missed any ceramics, chopsticks, cookware or noran. The little noodle shop at the alley intersection is a great place to rest your feet and grab a bowl of udon for only 170 yen. Can't wait to go back.